Start a Mozy Free Trial Now! Mozy Online Backup is one of the leading providers of online storage for home and business users. This review will concentrate on Mozy Home; if you have many PC’s to backup, a server, or network shares then see our Mozy Pro Review. Mozy has been around since 2005, which is a long time for an online backup service, and were impressive enough to be bought out by Fortune 500 storage heavy weight EMC Corporation a few years ago. While not exactly an innovator, Mozy concentrates on doing backup and restores reliably. While not on the bleeding edge with every feature, they do distinguish themselves by offering local backup, such as to a USB hard drive, as a complement to online backup. The USB hard drive can be kept on-site for convenience or even stored in a local bank safe deposit box for security. In fact, as long as you are not trying to synchronize computers and/or devices, Mozy Home is probably the best choice for your online backup needs. Keep reading to find out for sure. Mozy online backup will work for most people. While they do not currently offer linux or other solutions they do cover Windows up through Windows 7, in both 32 bit and 64 bit versions and the support Mac OS X as well. One previous point of contention with Mozy, however, is that they only supported one PC/Mac per account. That limit is now up to 3. (For more than 3 see Mozy Pro) Some other online backup services will allow multiple computers to be aggregated into one online storage account. If you want to get your data backed up online quickly, easily and affordably, then Mozy is a good choice for you. Click here to backup online with Mozy Home right now. Mozy will NOT backup network drives or shares. This can be inconvenient, but Mozy does offer a Mozy Pro version that does allow this. Mozy is not a program for synchronizing multiple devices. Mobile apps do not currently stream media from the cloud. They no longer offer a flat rate for unlimited backup. Basic service is 50GB with upgrades available. Video files over 50MB will NOT automatically be included in backups. (Other data files are) Unfortunately, this is not necessarily obvious. Mozy is a great online backup service for most people, especially if you just have one to three computers and you want backup to be simple, automatic and painless. 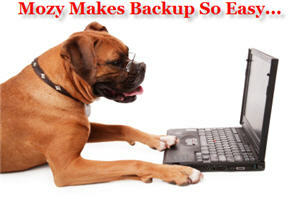 Online backup and restore just does not get easier or more reliable than Mozy Home.